PTFE Hoses are for use with oxygen, helium and hydrogen gas service to eliminate diffusion of lighter than air gasses. PTFE is also good for high purity applications where offgassing of hydrocarbons is a concern. Armor Guard Braided Stainless Steel Hoses provide superior protection from cutting, kinking or crushing. 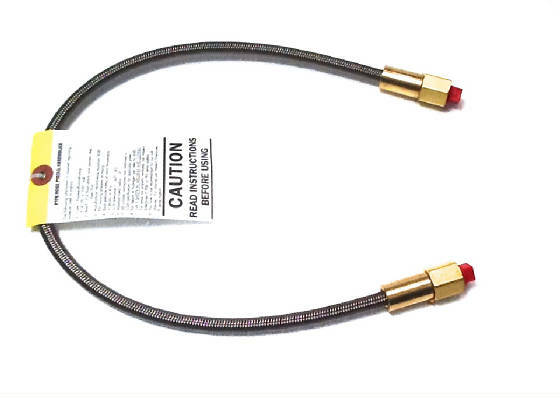 Crimped ends offer whip protection if hose is severed due to over pressurization. Hoses supplied with 1/4 NPT terminations but may be changed for customer requirements. Safety Guidelines and Instructions attached to each hose. 6000 PSI Flexible hoses are Teflon lined and are available with or without Armor Guard. Appropriate for newer high pressure CGA's. Custom lengths and JIC end connections are available. Pricing provided upon request. Please call to order 866-737-7247. For oxygen service as well as helium and hydrogen gas service. ¼ NPT female ends. Teflon lined, stainless braided hose for newer high pressure GA’s. Available with or without Armor Guard. ¼ NPT female ends.